On this episode of Getting To The Root Nailah Andre investigates New York City Mayor Bill deBlasio’s plan to close the third biggest jail in America Rikers Island. 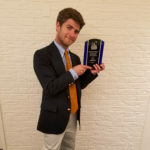 Benjamin H. Abrams is an independent radio journalist and undergraduate student at Hofstra University, where he is currently pursuing a bachelor of arts in radio production. Born and raised in Philadelphia, PA, he currently serves as a producer and co-host of Getting To The Root, an audio documentary & public affairs program on WRHU-FM, and available on Required Radio. He also serves as a producer, anchor and reporter for the WRHU News Department, Long Island’s largest radio news team. Outside of his academic career, Ben has worked with organizations like WPPM-LP, the community radio station wing of PhillyCAM (Philadelphia Public Access Corporation). Ben is an accomplished musician, with over 17 years of experience on guitar and over 7 years of songwriting experience. Ben’s work and contact info are available on SoundCloud, Mixcloud, AIRmedia.org and PRX.org. Tagged #billdeblasio, #gettingtotheroot, #newyorkcity, #prisonreform, #rikersisland.